Rug overdyeing is the process of adding color to an old worn rug to give it an updated look that matches your decor. Give your space a bold statement piece with The Carpet Chemist’s rug overdyeing service. What is your favorite room to spend time in your home? The living room? Bedroom? Your spa-like bathroom? Does it feel like something is missing but you can’t quite put your finger on it? 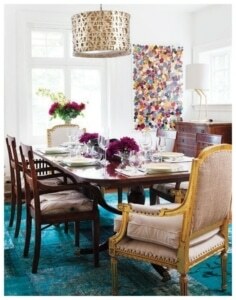 Try this on for size; imagine that old worn and faded rug being transformed into a bold colorful statement piece. Imagine if that rug could magically match the turquoise throw pillow on your reading chair, or the painting you have hanging in your foyer. Would it completely transform the look and feel of the room? Would you want to host more book club meetings or monthly bunco parties at your house? After living with beige walls and carpets for the past 15 years, try adding an overdyed rug to your dining room or eat-in kitchen and see how it makes you feel. It may be just what you’ve been missing. No two rug overdyeing projects are going to be the same. The carpet Chemist specially formulates a hot dye solution that is prepared in a huge vat in our Chemist Lab. Your rug will marinate in the dye bath for several hours to several days, depending on the material of your rug, the size, and structural integrity. Some rug overdyeing jobs may only take hours and not have to be submerged at all. The dyes can be applied with our dye spraying machines, which again, will depend on the material, size, age and structural integrity of the rug. Learn to love your old rugs again with The Carpet Chemist’ custom rug overdyeing service. Imagine what a splash of color can do for your room! Upload a pic of your rug for an instant rug overdyeing quote. Our IICRC-certified team provides no-obligation estimates. Connect with our team at (800) 515-1342 or by using the secure form below.